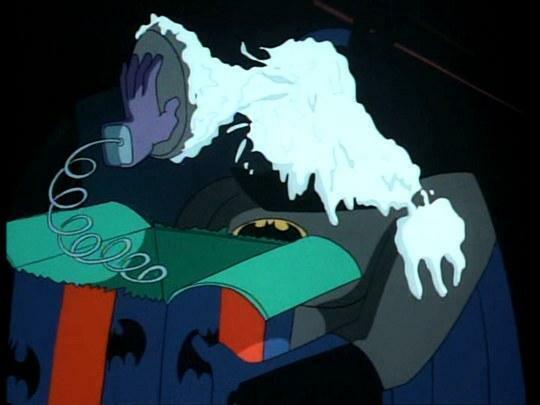 The Jetix block on Toon Disney has scheduled the Batman: The Animated Series episode “Christmas With the Joker” for Thursday, December 25th, 2008, at 9:00pm (ET). The episode is described as follows. The Joker takes over Gotham’s airwaves and terrorizes the city during Christmas. Holding Commissioner Gordon, Detective Bullock, and Summer Gleason hostage, he challenges Batman to find him before midnight, or else the hostages will have a very un-merry Christmas. Cartoon Network has passed along the episode synopsis and two dozen images for the upcoming Batman: The Brave and The Bold episode “Day of the Dark Knight!.” To get a closer look at the images, click on the thumbnails below. The all-new Batman: The Brave and The Bold episode “Day of the Dark Knight!” is scheduled for January 2th, 2009. Below is the description. The evil Morgan Le Fey has taken over Camelot and turned everyone to stone! To thwart her plans, Merlin transports Batman and Green Arrow back in time to retrieve Excalibur, defeat Etrigan, battle dragons and return King Arthur to the Throne! In the teaser, Guy Gardner teams up with Batman to stop a criminal riot at Green Lantern Corps. This week’s episode of Batman: The Brave and The Bold on Cartoon Network will be a repeat of the series opener “The Rise of the Blue Beetle.” The episode will air Friday, December 19th, 2008, at 8pm (ET) on Cartoon Network. Cartoon Network has also scheduled the episode “Terror on Dinosaur Island!” to re-air at 8pm (ET) on December 26th, 2008. Stay tuned for our exclusive coverage of Batman: The Brave and The Bold updates. A representative for Teletoon has informed The World’s Finest that Batman: The Brave and The Bold is slated to premiere on Sunday, January 11th, 2009 at 9:00am (ET) on the Canadian animation network. Batman: The Brave and The Bold will kick off its run on Teletoon with the episode “The Rise of the Blue Beetle,” with new episodes to follow every Sunday in the 9:00am (ET) timeslot. The official description for the series is as follows, as seen below. Building on the iconic character of Batman, this latest interpretation of the classic Batman franchise finds Batman teaming up with heroes from across the DC Comics Universe, delivering nonstop action and adventure with a touch of comic relief in this new animated series. Light in tone, Batman: The Brave and the Bold will introduce younger viewers to a famed hero while still offering plenty to excite diehard fans–the visual style of the series has been inspired by the look and feel of the work of 40s and 50s classic comic book Batman artists. Fans of all ages will cheer the caped crusader as he battles crime and injustice. Best of all, Batman isnt going at it alone! Blue Beetle, Green Arrow, Aquaman and countless others will get a chance to uphold justice alongside him. Though still based in Gotham City, the Caped Crusader will frequently find himself outside city limits, facing situations that are both unfamiliar and exhilarating. With formidable foes around every corner, Batman will still rely on his stealth, resourcefulness and limitless supply of cool gadgets to bring justice home! Batman: The Brave and the Bold is a 30-minute animated action/adventure series from Warner Bros. Animation and based on the DC Comics character Batman, created by Bob Kane. The series is executive produced by Sam Register, and the producers are James Tucker and Linda M. Steiner. The series is based upon the popular DC Comics comic book characters. On top of premiering the new Batman: The Brave and The Bold, Teletoon will also continue to air reruns of the popular The Batman animated series Monday to Friday at 5:30pm (ET) beginning January 5th, 2009. Official details on the January 2009 episode schedule for Batman: The Brave and The Bold on Teletoon are expected shortly. Teletoon previously aired the Batman: The Brave and The Bold episode “The Rise of the Blue Beetle” when the network gave viewers a preview of the series in November 2008. Official details on the statue can be found below. On the mystical island of Themyscira, a proud, strong warrior race of Amazon women lives in a utopian civilization shielded from the corrupt world of man. But a betrayal within the Amazon sisterhood leads to the escape of Ares, the God of War, and Amazon Princess Diana must capture him before he unleashes global chaos and destruction. With the aid of cocky fighter pilot Steve Trevor, Diana tracks Ares to the United States for a battle unlike any humankind has ever faced. A fabulous voice cast Keri Russell, Nathan Fillion, Alfred Molina, Virginia Madsen, Oliver Platt, Rosario Dawson and David McCallum injects blood, thunder and passion into this epic tale of the princess who becomes the worlds favorite super heroine. This hand-painted, cold-cast porcelain maquette of Wonder Woman is based on art from the highly anticipated Warner Home Video direct-to-DVD animated original movie Wonder Woman! 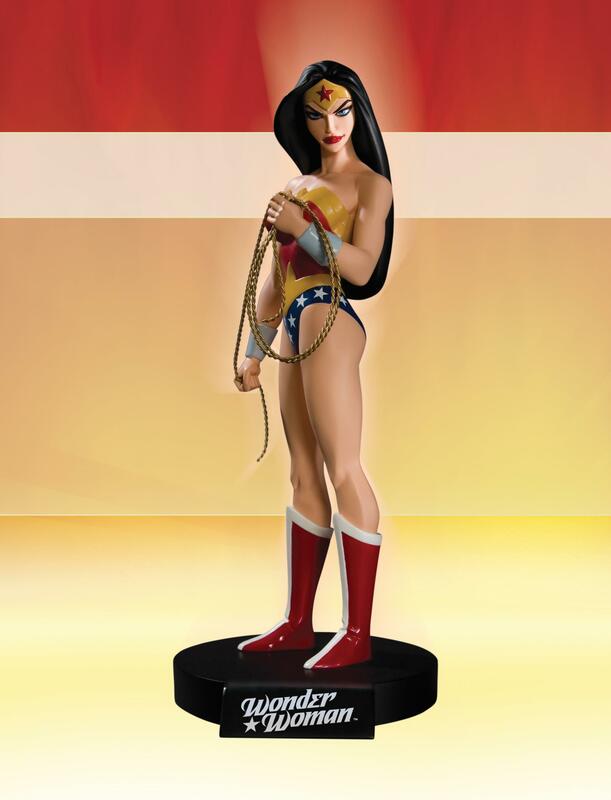 Measuring approximately 9.25 tall x 3.75 wide x 4.25 deep (including the base), the maquette includes a 4-color Certificate of Authenticity and is packaged in a 4-color box. Limited Edition of 4000! Advance-solicited; on sale March 25, 2009 for $89.99 US.